Growth direction and magnitude of the fluctuation amplitude of the most unstable mode. The coloring indicates the magnitude in a logarithmic scale, while the arrows indicate the growth direction (non-logarithmic scale along both axes), which is determined up to a sign. Accordingly, in the unstable region, fluctuations grow indefinitely by reducing the shear rate and increasing the density (or vice versa), providing a nonlinear feedback mechanism for the shear-density-coupling-instability. 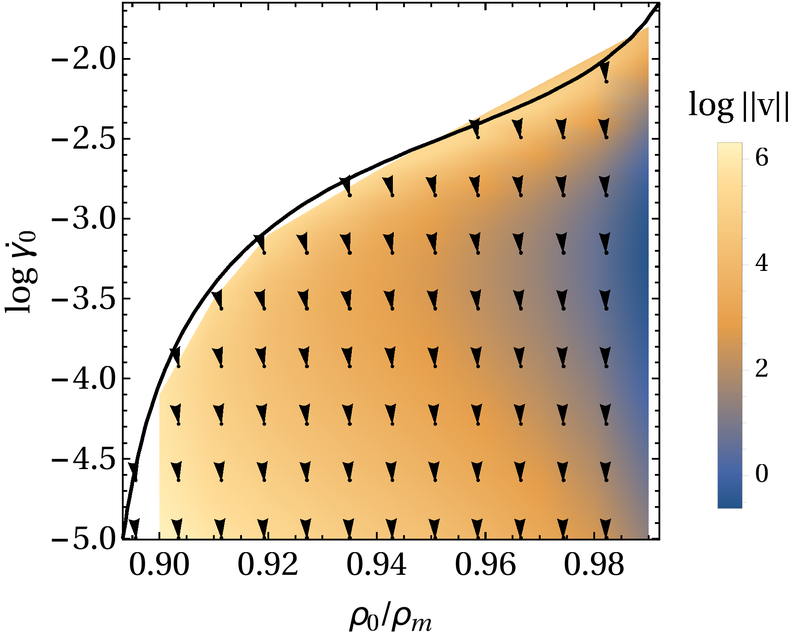 Flow behavior of a single-component yield stress fluid is addressed on the hydrodynamic level. A basic ingredient of the model is a coupling between fluctuations of density and velocity gradient via a Herschel–Bulkley-type constitutive model. Focusing on the limit of low shear rates and high densities, the model approximates well—but is not limited to—gently sheared hard sphere colloidal glasses, where solvent effects are negligible. A detailed analysis of the linearized hydrodynamic equations for fluctuations and the resulting cubic dispersion relation reveals the existence of a range of densities and shear rates with growing flow heterogeneity. In this regime, after an initial transient, the velocity and density fields monotonically reach a spatially inhomogeneous stationary profile, where regions of high shear rate and low density coexist with regions of low shear rate and high density. The steady state is thus maintained by a competition between shear-induced enhancement of density inhomogeneities and relaxation via overdamped sound waves. An analysis of the mechanical equilibrium condition provides a criterion for the existence of steady state solutions. The dynamical evolution of the system is discussed in detail for various boundary conditions, imposing either a constant velocity, shear rate, or stress at the walls.